The Spokane Indians needed someone to eat innings in this August 1989 and Lance Banks did just that. Starter Brice Florie made it in the third inning, but didn't record an out. By the time his line was done, he'd been tagged for nine runs, seven of them in that third inning alone, according to The Spokane Chronicle. Banks took over and proceeded to give up just three hits over the next five innings, according to The Chronicle. He didn't get a win or a save, but he did his job. That game was one of 24 times that year Banks went out and did his job for the Indians. For Banks, though, his job only lasted one more season. In three total professional seasons, Banks never made AA. Banks' career began in 1989, signed by the Padres as an undrafted free agent out of his native Wyoming. 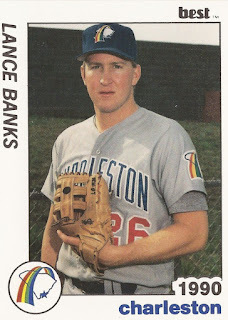 Banks played that first season with the Padres between Spokane and the rookie Arizona League. He got into one game in Arizona and those 24 in Spokane. Between the two levels, he picked up two wins, one save and a 3.35 ERA. He gave up an RBI single in a July game and threw a hitless ninth in an August contest. For 1990, Banks moved to single-A Charleston. In 48 relief appearances there, he picked up seven wins and two saves. He also came in with a 2.82 ERA. Banks made single-A Waterloo in 1991. He got into 39 games, two of those appearances starts. He went 4-2, with three saves. His ERA came in at 4.58. It was his final season as a pro.